Here's a novelty. Take part in the Grand National! This simple viewed-from-above race-em-up puts you in the saddle of a National runner with 30 fences to jump. First, though, you have to decide whether you'd like a three, five or ten year game and spend the £10.000 you're given on a horse. Any remaining monies after the purchase can be gambled on the race (betting on your own horse is a good idea). The idea then is to work your way up through the pack by going faster than the other horses but without exhausting your horse. Speed and energy indicators are on opposite sides of the screen and the game really revolves around keeping these two balanced until you can go flat out for the line a few fences from the finish. To keep you on your toes as you race round, you have to hit the fire button at the correct time to force your horse to jump and clear the fences. Finish a race in the top four and you'll ear some money. At the end of the game you'll want to have amassed as much of the green stuff as possible. This is very simple stuff. There's almost no depth to the game and although it's quite playable it's not likely to keep you interested for much more than an hour. Dabei läßt sich die Sache gar nicht so übel an: Ehe man im Grand National, immerhin der Welt härtestes Hürdenrennen, an den Start gehen darf, muß zunächst einmal die Spieldauer bestimmt werden (ein, fünf oder zehn Jahre), dann kauft man sich ein Pferdchen. Daß mit den anfänglichen 10.000 Pfund kein preisgekrönter Luxusgaul drinn ist, ist klar, aber schließlich warten zwischen drei- und vierzigtausend Mücken Preisgeld, und man kann ja auch ein bißchen wetten (muß gottlob nicht unbedingt auf die eigene Mähre sein). Hier ist jedoch nichts weiter als ödes Joystickrütteln angesagt; Hürden werden per Feuerknopf genommen. Die bescheidene Grafik zeigt das Geschehen aus der Vogelperspektive, in zwei kleinen Windows kann man doch die Seiten- bzw. Gesamtansicht bewundern. Als Sounduntermalung gibt's Hufgetrappel, einen toll digitalisierten Ansager und nervtötendes Gedudel im Auswahlscreen. Insgesamt glänzt Grand National durch kaum vorhandenen Spielspaß: Das strategische Element beschränkt sich auf die Auswahl des richtigen Pferdes, und der Action-Teil ist so langweilig, daß er die Bezeichnung eigentlich gar nicht verdient. Spezialität: Zwei Disks, es wird aber nur ein Laufwerk angesprochen (ist auch nur ein Wechsel erforderlich). Die schlecht kopierte englische Anleitung enthält eine Liste aller verfügbaren Pferde. T his is the official licence of the Seagram Grand National 1990, incorporating all of the participating horses and some jolly nice sound effects. At the start of your career (which can last for 1, 5 or 10 years, if you decide) you have no horses and £10,000. The first things you have to do is buy a horse to ride in the National. Clicking on the appropriate icon gives a list of nags, some are top class fillies that cost too much, the ones you can afford initially are pretty run-of-the-mill. To make your money back you can place bets on any of the horses running, including your own, and if you have bought a really duff horse, you are going to need all the money you can lay your hands on. Select which of your horses to ride, and you are under starters orders. The race is represented slightly unusually. There are three windows on screen, all of which you have to watch. The first, and smallest window, has a plan view of the course, with your nag as a little flashing dot. The text below this window also gives your current race details, such as time and your current position. Window number two has a side-on view of the horse galloping along the track, and gives you a visual representation of your horse approaching fences, allowing you to judge the best moment to jump. 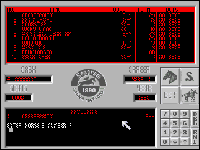 Finally window three, the largest, provides you with a top view of the race, showing you on your horse, and any other nearby. 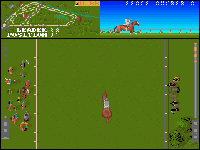 It is from this screen that you steer your horse through the race, and it also contains speed and stamina meters. The higher the speed meter, the faster your stamina falls. The key is finding a good balance of speed and energy. The graphics are not bad, by any standard, but they are little too functional. And for the most part the same applies to the sound. But that said, I like the sampled speech which announces the winners, although the jingly tunes that plays on the options screen grates slightly. It is fun, there is no doubt about that, but I do feel that it could do with a steroid or two in both gameplay and variety, and probably falters in the lastability stakes.